"Taiken-Kai" (trial treatments) are also available to the general public at no cost. Notes: Students receive a class manual at registration, and certificate upon completion. • Deposits & Regist. Fees are non-refundable but may be applied towards a future class or session within 1 year. • Skills taught in classes, workshops, and training are for personal development intended for self/family/friends. • Reiki works in conjunction with regular healthcare & is not intended to substitute medical or psychological care. 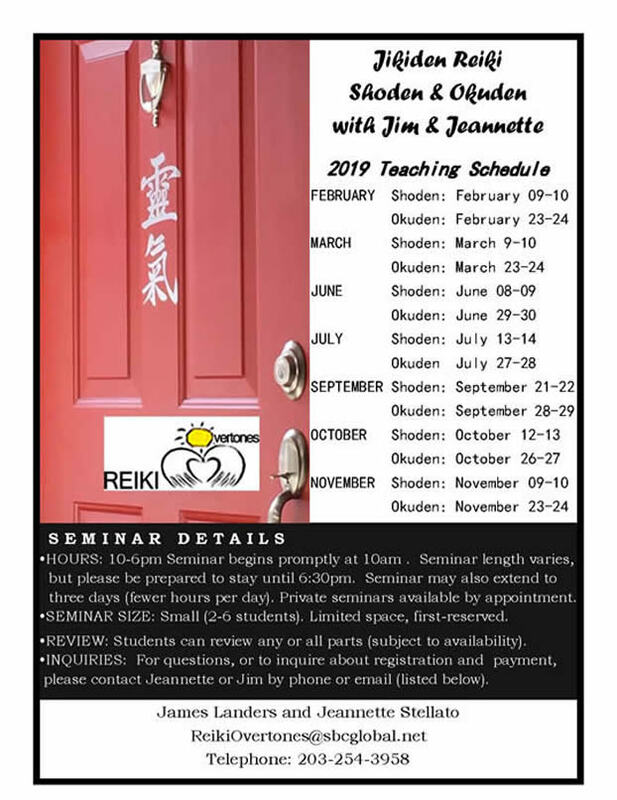 •Review: Students may register for classes as a "review"
•Reiki Training classes/workshops are held in Fairfield/Bridgeport/Norwalk/Westport, CT unless otherwise noted. *Large classes taught at local venues - 1st-reserved. Hours may vary depending on the size of each class.